Fashionable Heart: Swatches from my recent swap with Antonia! Swatches from my recent swap with Antonia! 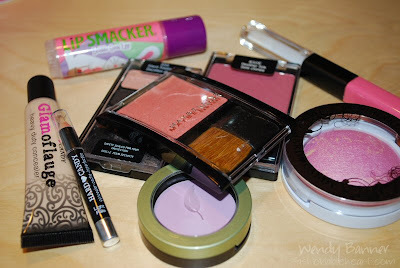 Left to right: Sally Hansen Natural Beauty Fast Fix Concealer in All-Over Brightener, Hard Candy Baked Blush in Living Doll, Maybelline blush in Pinch of Coral, and Wet-n-Wild blush in Heather Silk. Wet-n-Wild eyeshadow trio in Silent Treatment. These shadows are so silky! Left to right: ELF lipstain in Birthday Suit (also comes with clear gloss), Hard Candy concealer pencil that comes with Glamoflauge both in the shade light (last swatch shows it lightly blended in). I will be doing a review on the concealer and comparing it to MUFE Full Cover Concealer!